Walk through Happy Valley Forest on a crisp autumn morning and experience the gorgeous fall colours on display. 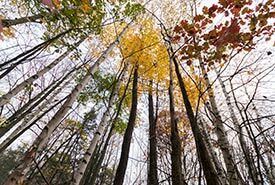 This moderate, three-kilometre hike is the perfect opportunity to visit the property and photograph the trees of Happy Valley Forest as they display their stunning fall colours. Learn about the Nature Conservancy of Canada's (NCC’s) work to protect one of the last remaining intact deciduous forests on the Oak Ridges Moraine. Following the tour, be our guest for lunch at Pine Farms Orchard in nearby King City. Our Leaders in Conservation support critical conservation work in Ontario through the gift of an annual contribution of $1,000 or more. Leaders' donations provide NCC with a reliable source of funding that allows us to undertake new projects and to develop the innovative approach to conservation that we are widely recognized for.